Every state has different exotic pet laws. In some places, you can have a pet squirrel or kangaroo while other places you can't have a pet rabbit. Some states are specific as to what animals they restrict while others allow pretty much anything to be kept as a pet. Find out what your state's exotic pet laws are here with these exotic pet law summaries but be sure to double check with your local government before getting your pet to make sure the laws haven't changed. While these are the state laws, there may also be local, city, and county laws that also apply. Laws are also subject to change. See the BornFreeUSA.org list of state laws and their list of pending legislation by state. No one can possess, sell, or import fish from the genus Clarias or Serrasalmus, Black carp, any species of mongoose, any member of the family Cervidae (deer, elk, moose, caribou), any species of coyote, fox, raccoon, skunk, wild rodents, or wild turkey. There are no licenses or permits required for ownership of exotic animals. No one can possess, sell, import or export live game animals (any species of bird, mammal, or reptile, including a feral domestic animal, found or introduced in the state, except domestic birds and mammals). This restriction includes wolf hybrids possessed after Jan. 23, 2002. The state also defines all non-domestic animals including wild felines, wild canines, bear, and primates as "live game." Restricted wildlife includes all non-domestic canines and felines, primates (except non-infant primates that are free from zoonotic disease), alligators, crocodiles, poisonous snakes and more. Special permits can be issued to specific individuals or groups to keep these animals if the request falls under categories for education, public health, commercial photography, wildlife rehabilitation, or wildlife management. Otherwise, they are illegal to own as pets. Large carnivores (lions, tigers, and bears) are illegal to own. There is also a limit of six animals per owner for bobcats, squirrels, rabbits, raccoons, quail, opossum, coyote, deer, red fox, and gray fox. Ownership of an animal obtained in another state must show verification it was legally acquired. To be short, no wild animals are allowed to be kept as pets in California. This includes all non-domestic canines and felines, elephants, crocodiles, and more. Colorado does not allow most exotic animals to be kept as pets, but you can keep some native reptiles, and what the state considers unregulated wildlife which includes sugar gliders, hedgehogs, kangaroos, and more. This state restricts potentially dangerous animals. Bears, large cats, and primates are included in the list of illegal animals to own in this small state. This state requires permits for wild mammals and hybrids. Non-native poisonous snakes are illegal to possess. Animals are classified into classes. Class I animals are illegal to possess and include bears, large cats, rhinos, crocodiles, and primates. Class II animals are allowed only with a permit and include howler monkeys, macaques, bobcats, cougars, wolves and more. A 2010 law forbids importing, selling, and releasing non-native species. This law further restricts capturing and keeping venomous reptiles and other reptiles of concern unless the owner had a permit before the law was enacted. Illegal animals are described as inherently dangerous animals. This classification includes kangaroos, primates, canines, felines, crocodiles, alligators, elephants, and cobras. Exotic animals are illegal in Hawaii. These include bears, large cats, wild canines, and more. The law forbids any animal or hybrid that can be a threat to livestock, the environment, agriculture, or wildlife. This includes big cats, non-native canines, and non-human primates. Permits can be obtained from the Idaho Department of Agriculture. Dangerous animals are not allowed to be kept as pets unless you are a zoo, licensed circus, or other acceptable organization. Dangerous animals include large cats, coyotes, wolves, bears, and poisonous reptiles. Primates are not allowed as pets unless they were in possession before 2011 and have been registered. There are no restrictions on other exotic species. This state is pretty straightforward with their exotic pet laws. No dangerous wild animal is to be possessed, owned or bred in Iowa. This is defined as non-domestic cats and dogs, bears, primates, numerous reptiles and more. Kansas does not allow dangerous regulated animals to be kept as pets unless you are a zoo, sanctuary, or other approved facility. Dangerous regulated animals include large cats, bears, and venomous snakes. No person may possess an inherently dangerous animal. This includes primates, dangerous reptiles, bears, large cats and more. Unless you were grandfathered in, you cannot own a primate, bear or cougar in this southern state. Permits are required for venomous or large constricting snakes. Permits are needed to possess or breed wild animals. You may not possess deer, bears, moose, or wild turkeys. A wide variety of exotic pets are restricted in this state. Wild felines, bears, raccoons, skunks, foxes, primates and other exotic pets are not allowed. Wild animals are not allowed to be kept as pets here. Wild animals are defined as non-domesticated animals. No large cats, bears, and wolf hybrids allowed in Michigan. All other animals not listed need a permit. This state has restrictions for owners of restricted pets that they acquired prior to the law changes in 2005. It is also unlawful to possess bears, non-domestic felines, and primates. 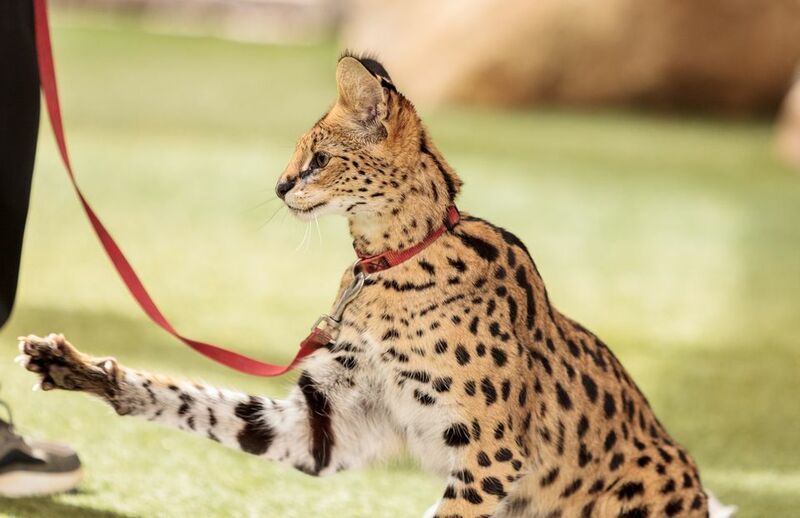 Small felines such as ocelots and servals are allowed in this state without a permit, but inherently dangerous animals as defined by the state's law need a permit to be kept as a pet. The permit requirements are steep and the permit is only good for one year for one animal. If you want to own one of the animals on this state's list of dangerous wild animals you must register it with the county in which the animal is kept. Lions, tigers, wolves, and poisonous reptiles are included in this list. A permit is required if you want to have a "wild animal menagerie." This is defined as anyone who does not exhibit their large cats, bears, etc., and does not have a minimum or a maximum number of animals listed. Other exotic animals must have a one-time entry permit and health certificate. There are no restrictions for reptiles or primates but you may not keep any non-domesticated felines, skunks, wolves, or bears as pets. Specific animals are listed as being prohibited in Nevada and include alligators, crocodiles, raccoons, and foxes. You may still own primates, monkeys, elephants, wolves and non-domesticated felines without a permit or license. Primates, venomous reptiles, bears, wolves, and other animals are prohibited. Potentially dangerous species are on the list of prohibited pets, including some you might not normally put in that class, such as some parakeets and ground squirrels. Zoos and exhibitors may apply for a permit after meeting extensive, but practical, requirements. It is unlawful for a person to possess non-domesticated felines, primates, crocodiles, alligators, and wolves. Their state website has a permit application available for non-domestic animals. The law states you are not allowed to own any wild animal, including non-domestic felines or canines, bears, crocodiles, venomous reptiles, and primates. This state allows individual counties and cities to create ordinances regarding exotic pets, therefore depending on where you live in North Carolina, you may or may not have any regulations. You need an entry permit from the State Veterinarian for bringing in skunk, fox, raccoon, non-domestic felines, coyote, marten, and brushtail possum. Depending on what category your exotic pet falls into, you may or may not need a license/permit to own them. Inherently dangerous animals as defined by the state are listed as Category 4 animals and require a permit. Ohio's laws have changed since the Zanesville massacre in 2011. Since then the Dangerous Wild Animal Act has taken effect and made numerous exotic animals illegal to own or require a permit to own what the state deems as dangerous. 2014 ushered in the last phase of the new laws. Just get a permit and you can own whatever animal you'd like. The state calls it a wildlife breeder's license. It is illegal to possess an exotic animal, defined as wild cats, bears other than black bears, canines not native to Oregon, alligators, crocodiles, or caimans unless you had a permit before the law was enacted. You must acquire a permit for the exotic animals that are listed as "exotic wildlife" by the state. Permits that require proof of adequate knowledge and housing for the animals desired are needed to possess primates and other exotic pets, including insects and amphibians. A permit to own native animals is needed, but there are no state laws concerning primates, reptiles or large cats. In order to own a primate, hoofstock, large cat, bear, or other exotic pet listed by the state you must obtain a permit and a veterinarian's examination. Class I animals (chimps, gorillas, cheetahs, etc.) are outlawed as pets but there are no rules on monkeys and small wild cats. A license is required to own many animals the state considers to be dangerous. This includes bears, coyotes, cougars, chimps, lions, tigers and many others. There are no laws regarding monkeys, wolves and other animals. In only very rare circumstances can you get a permit to own one of the many animals listed as prohibited. Animals that fall into this category include bears, all non-domesticated felines, ferrets, and more. Unless you want exotic animals for educational purposes or exhibition, you cannot keep them as pets. Exotic animals include primates, bears, poisonous reptiles, large cats, and wolves. A permit is needed even for educational and exhibitory purposes. Non-native animals listed in the law are illegal to keep as pets. Educational and exhibitory purposes need a license and anyone can keep primates as pets. But you can keep a non-human primate. As of 2007, Washington state laws changed to restrict dangerous animals from being kept as pets. This list includes bears, wolves, large cats, alligators, primates and more. A fee of $2.00 is issued to get a permit for native species that were legally acquired. Dangerous non-native wild animals were outlawed in 2015 unless previously in possession, so long as a permit is obtained. No restrictions here, except that all animals commonly sold at pet shops need certificates of veterinary inspection if brought from outside the state. Game animals are regulated and exotic species (anything not found in the wild in the state or domesticated) are illegal to possess as pets.